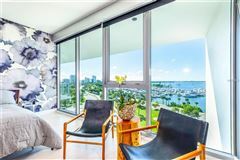 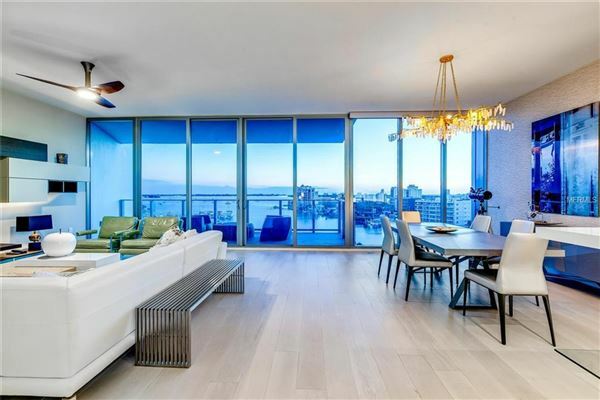 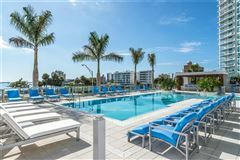 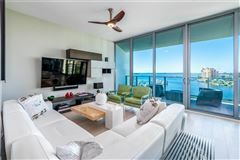 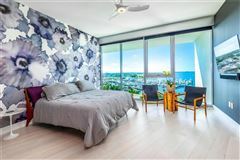 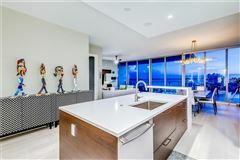 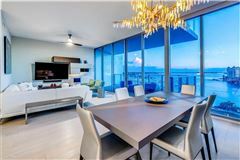 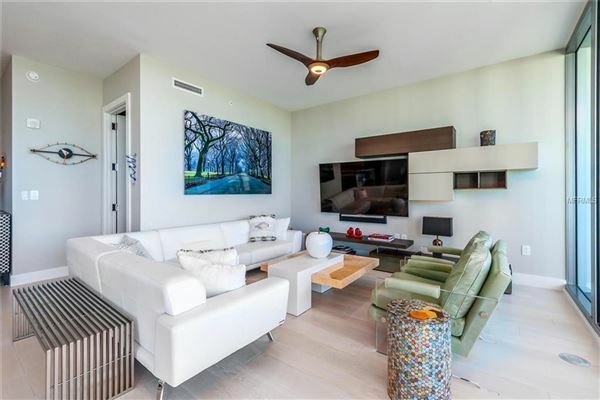 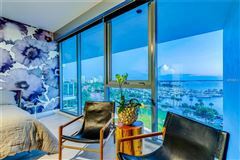 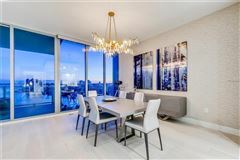 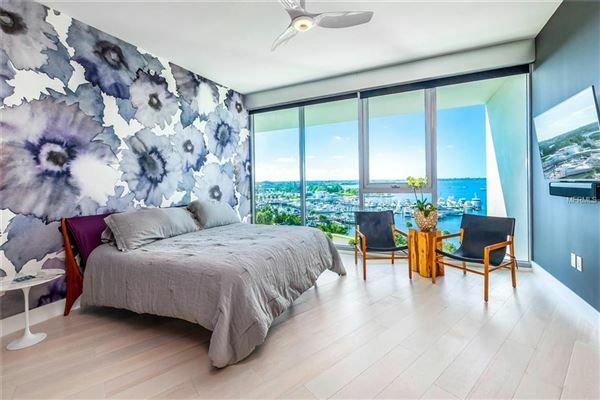 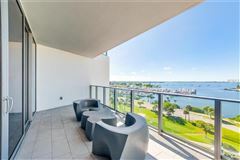 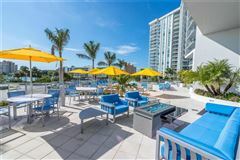 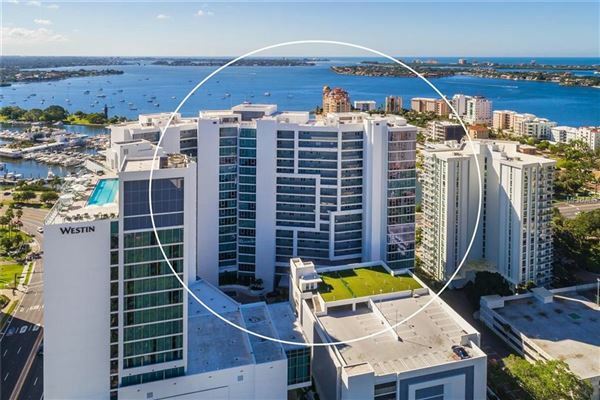 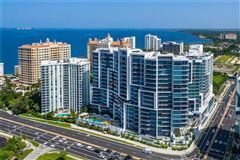 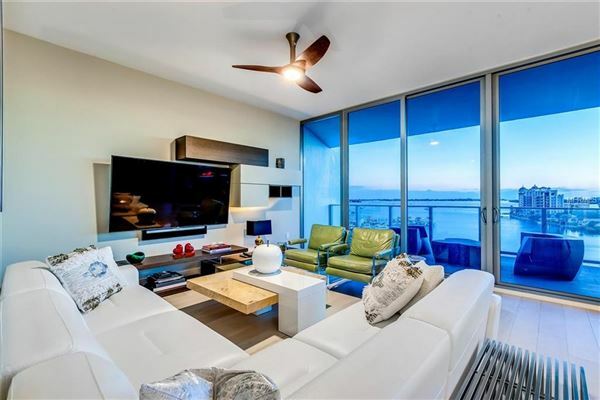 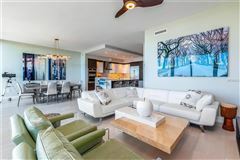 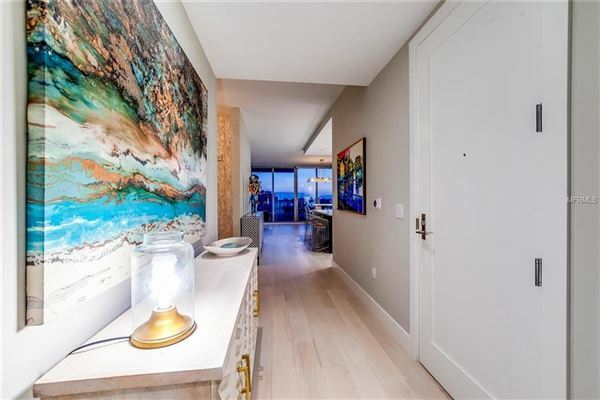 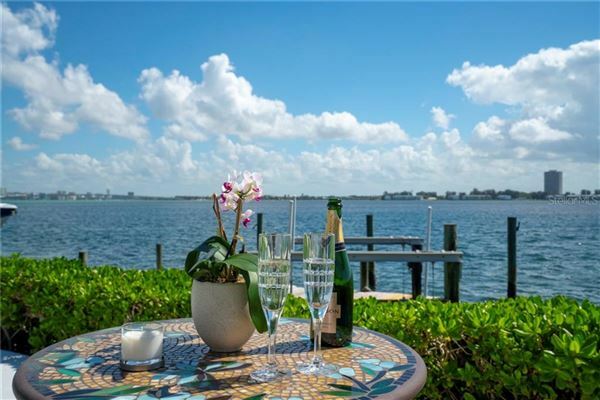 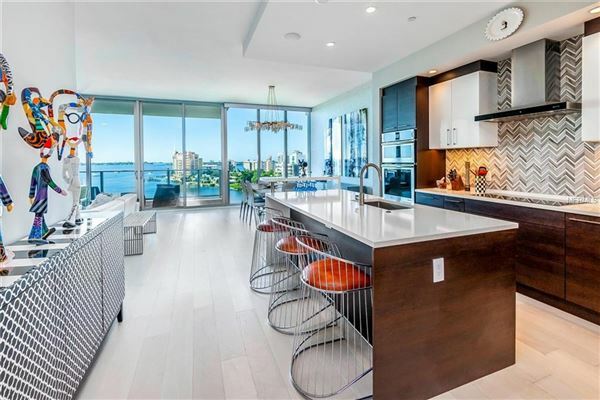 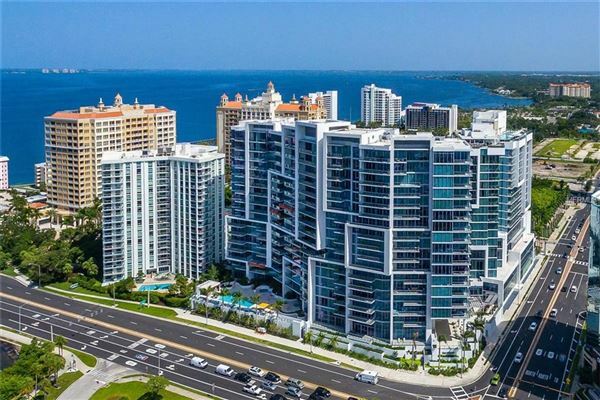 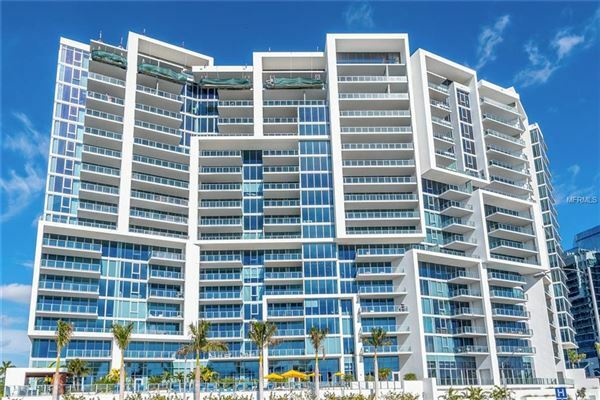 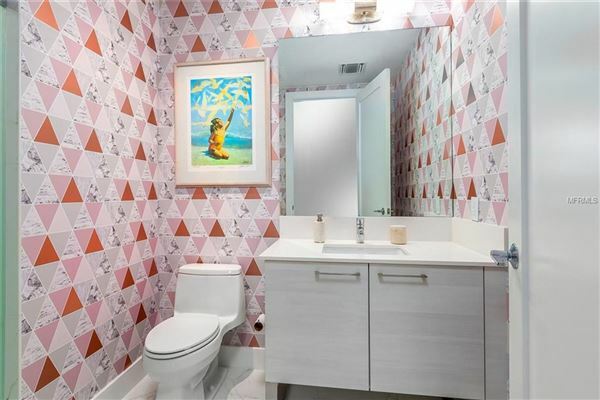 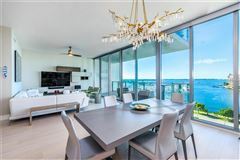 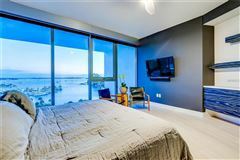 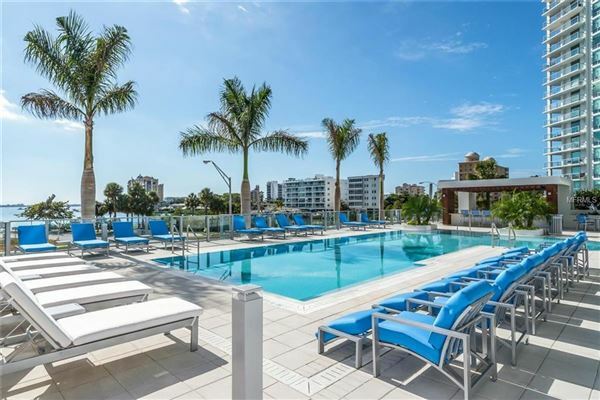 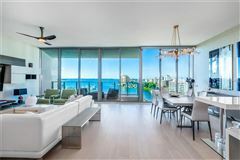 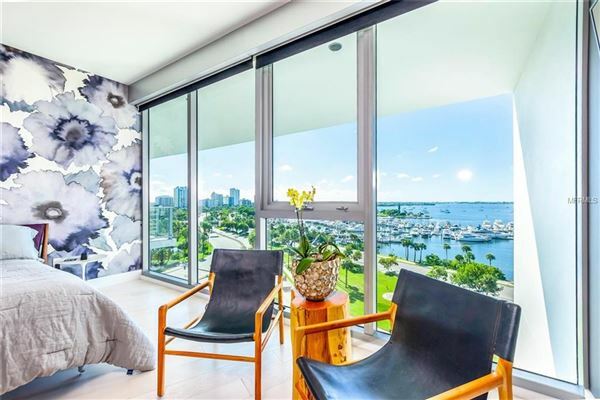 Perched with grace and majesty in the Sarasota sky, this 7th-floor residence at the VUE bestows supreme serenity with broad vistas of Sarasota Bay, Golden Gate Point, and downtown Sarasota. The extraordinary three-bedroom plus den condominium is comprised of 2,440 square feet of living space featuring soaring ceilings, dramatic 10-foot floor-to-ceilings glass, contemporary interiors with luxury appointments, and outdoor terraces perfectly positioned to delight in the waterfront urban setting. 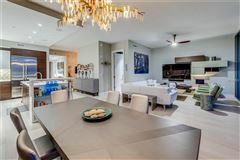 An open floor plan invites you to celebrate simple daily rituals or entertain guests with class and distinction. 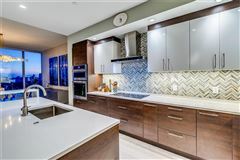 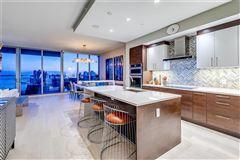 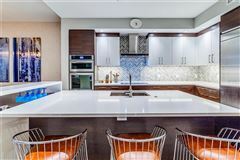 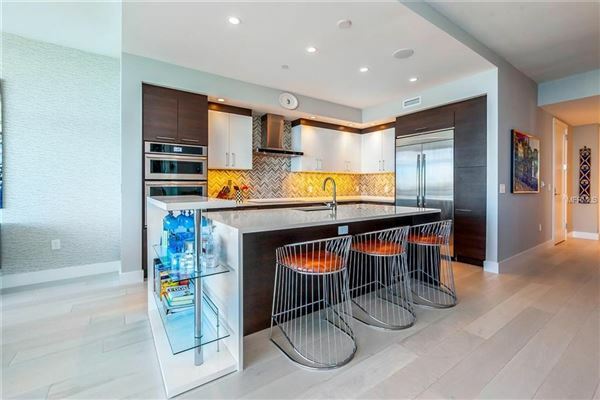 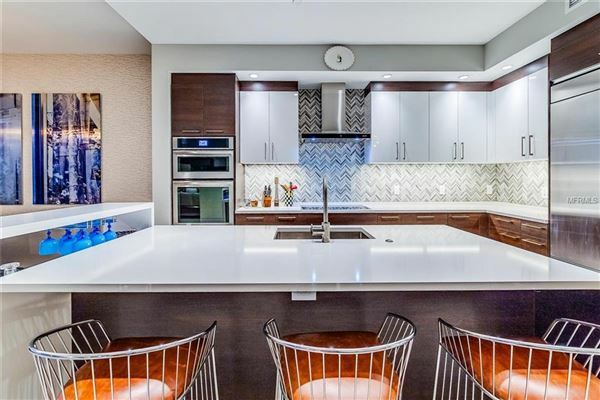 The gourmet kitchen boasts state-of-the-art appliances including induction cooktop, center island, sleek cabinetry, custom backsplash, and breakfast bar. 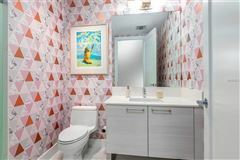 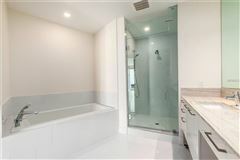 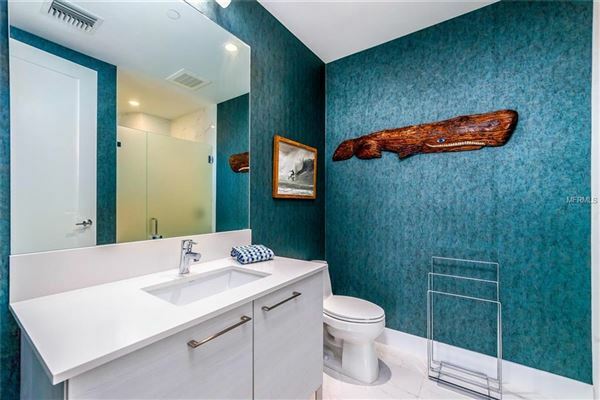 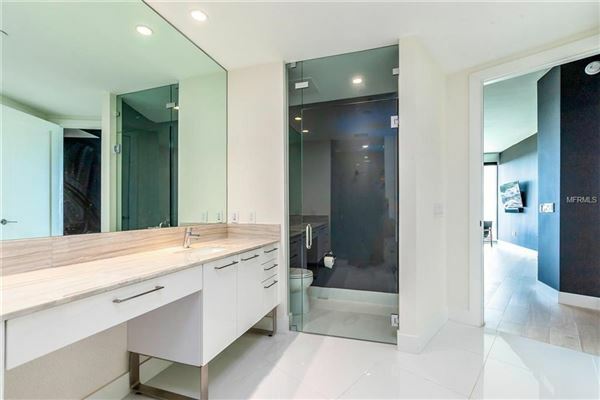 The master retreat overlooks the Bay and includes a spa-like master bath with soaking tub, dual vanities, and walk-in shower. Two additional bedrooms provide space and comfort for visiting family and guests. 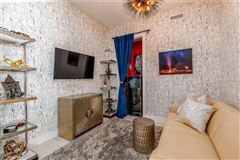 Designer upgrades include high-end built-ins, media package, California closets, electric Lutron blinds, custom wallpaper and paint colors. 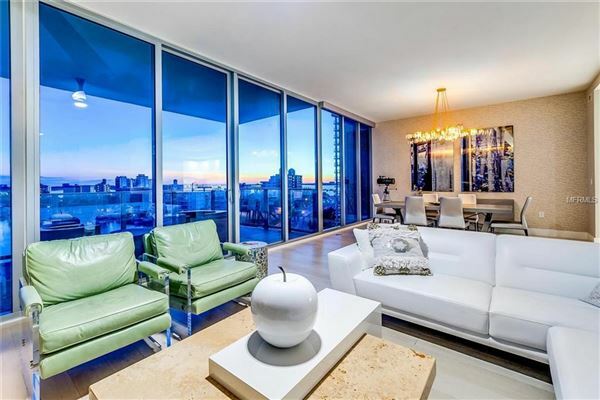 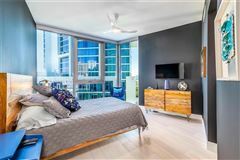 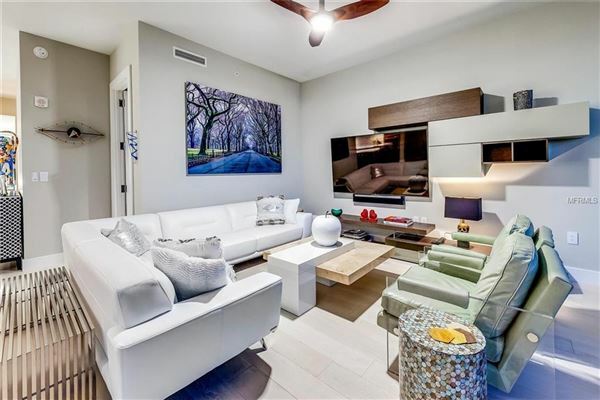 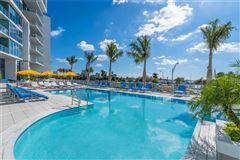 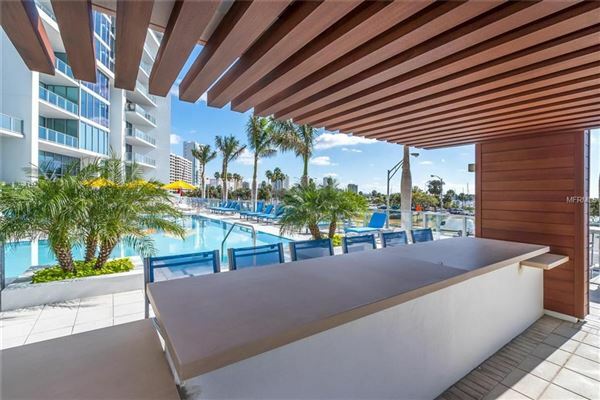 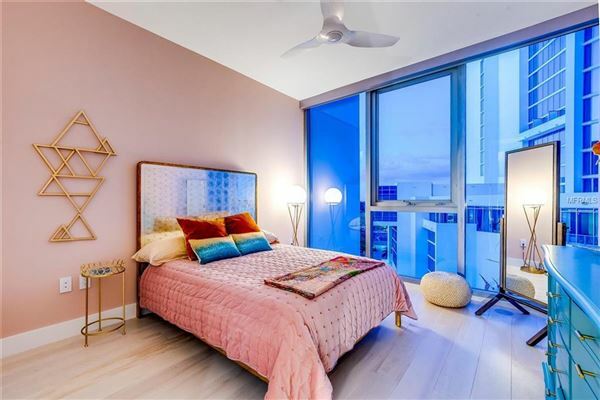 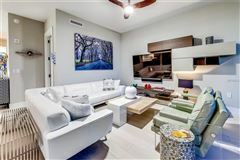 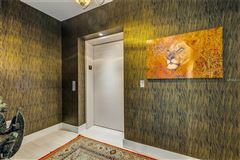 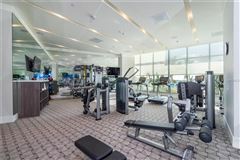 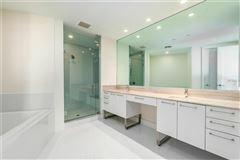 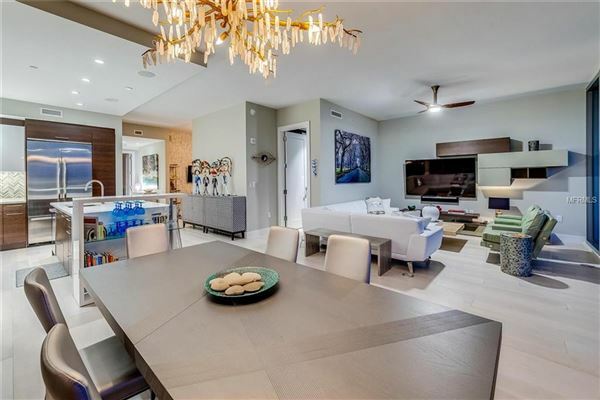 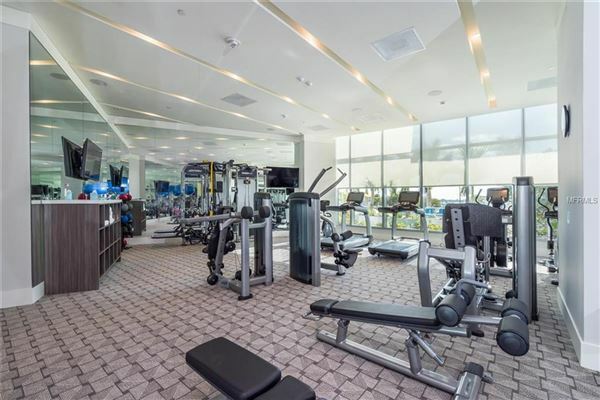 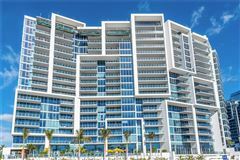 The VUE is a stunning example of modern design with exceptional amenities including fitness center, club lounge, rooftop dog park, and a spectacular pool area. 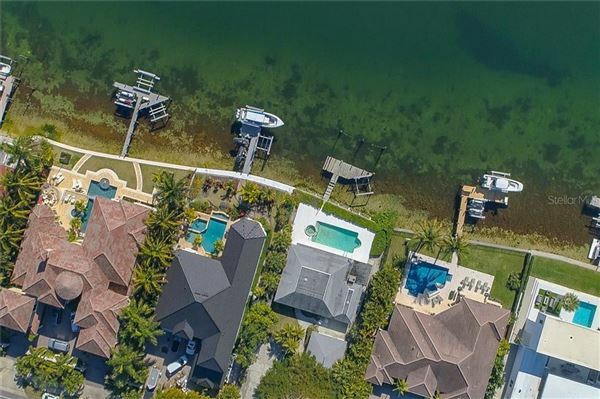 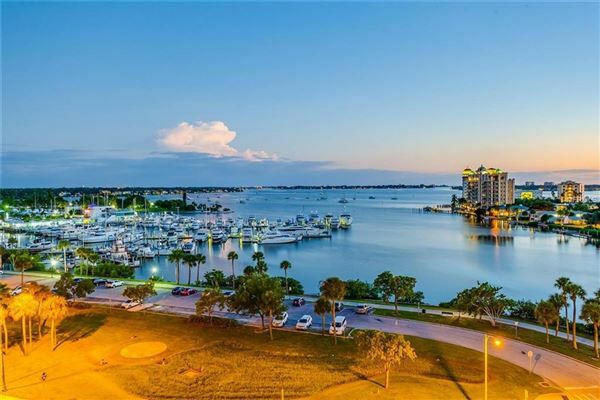 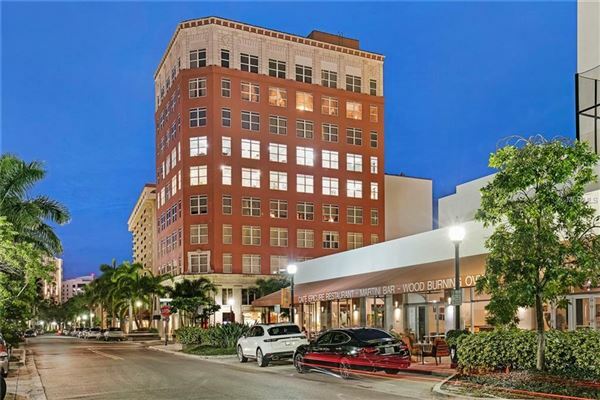 Located within downtown Sarasota, experience a rare blend of arts and culture, nautical enjoyment, fine dining, art walks, weekend festivals, farmer’s markets, and eclectic shopping experiences. 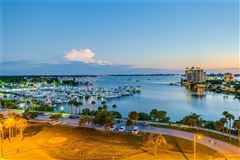 Brilliant white sand beaches are just over the bridge.